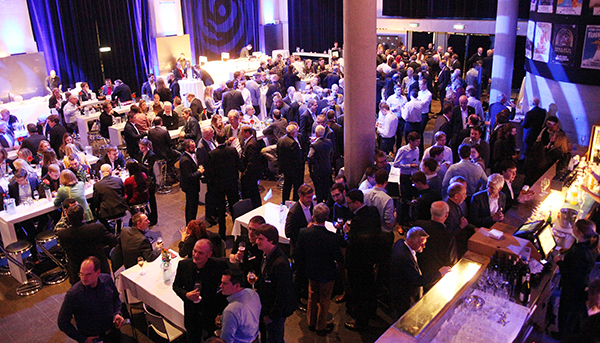 Dr. Bernd Pätzold, CEO of PROSPTEP AG, welcomed around 300 employees, former employees and friends of the company to the anniversary celebrations, which were held in what was once one of the city’s power stations and now serves as a cultural center. But, as Pätzold said, the company wasn’t interested in talking about the past but about the future. He nevertheless used the celebrations as an opportunity to thank the company’s founders and long-serving employees for the commitment they have shown. The guests partied until late into the night, enjoying lively musical entertainment that enticed a number of people onto the dance floor. "The next 25 years will be even better," said Pätzold, even though he has no magic formula for the future. Dr. Martin Holland, responsible for Business Development at PROSTEP, described to those present where the journey could take them. Sometimes it is better to first make a decision and then plan how to implement it, he said, alluding to Caesar's decision to cross the Rubicon. The Internet of Things, the cloud, blockchain and artificial intelligence are all topics of the future that PROSTEP is examining closely. 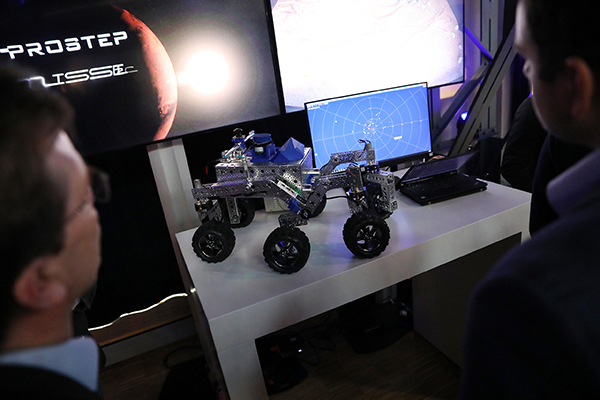 In his talk, Holland presented a 1:1 model of a Mars Rover that the company had built together with student employees with the aim of creating a “testing ground” for topics such as IoT integration and the linking of digital twins and VR technology using the Mission Control Center. The winners of the Fraunhofer blockchain hackathon sponsored by PROSTEP, illustrated at one of the exhibition stands how blockchain could be used to make paying for coffee more fair. And they also offered the best coffee in the room. "The level of complexity will continue to increase, not decrease," predicted Riedel. And if this complexity is to be made manageable, everything needs be interlinked more efficiently. This applies, for example, to automation technology, which blurs the functional boundaries between ERP and MES, but also to the linking of digital shadows as representations of the past and digital twins as representations of the product as a living entity in the future, PLM will also require greater flexibility through the merging of development and operations. There are examples that demonstrate that DevOps is making more agile development possible not only in the software sector but for all products. Agility was the watchword for Ralf Waltram, head of IT Delivery at the BMW Group, who presented the carmaker's showcase projects involving the implementation of agile approaches in corporate IT to the guests. Becoming 100% agile is BMW's answer to the disruptive changes brought about by digitalization and it has four main thrusts: processes, technology, organization and culture. IT is no longer organized according to projects but instead is organized in agile, product-oriented teams that are responsible for the solutions’ development and operations (DevOps). Back2Code is the maxim, i.e. BMW is once again developing more software itself. Waltram said that the company’s experiences with agile methods in SAP environments have also been good. User satisfaction has improved dramatically thanks to the faster provision of new functions, and the number of open tickets has been reduced by 72 percent. Waltram went on to say that a more open, intuitive IT landscape is an important prerequisite for implementing agile methods. This was also made clear in the presentation given by Dirk Spindler, head of R&D Processes Methods and Tools at Schaeffler. As Spindler said, the company is very diversified, has a huge portfolio comprising approximately 20,000 products and uses different business models. The desire to standardize the IT landscape is an illusion that has devoured an enormous amount of money. Schaeffler intends to achieve its objective of fully-integrated PLM by setting up a model-based product engineering process and linking the data on an overarching platform. The aim is to ensure that the workplace of the future provide users with only the functions and information that they needs for their work in a cockpit. While many companies are still busy digitalizing their business processes, Daimler is already giving thought to the digital transformation of its business models. Connected, Autonomous, Shared Services and Electric (CASE) are closely interwoven new topics that are bringing about a radical change in the way in which work is performed, methods and business models," said Dr. Siegmar Haasis, CIO of R&D Cars. But they also have to be financed by the company’s core business. As far as IT is concerned, this means not only agile approaches but also an even higher level of digital frontloading in order to get the vehicles on the road faster and make them right the first time round: "When it comes to autonomous driving, the race will not be won on the road but in the computer center," said Haasis. The supreme discipline here is the digital twin in the context of a holistic approach that supports different variants. Digital transformation cannot be achieved on its own but only together with partners. Jochen Breh, who works in Governance IT Architecture at Bosch, underscored this point in his talk on the IoT platforms and ecosystems of the future. "Even the best solution will fail without an ecosystem," Breh explained. On the other hand, an ecosystem can only function properly if all the parties involved, from the owner of the ecosystem to the developers to the customers, benefit from it. IoT platforms provide the technological basis for these ecosystems because, as Breh went on to explain, solutions are created on them. Because distributed ecosystems are going to grow closer together, open source and microservices are the key to building platforms quickly and for connecting them with each other. At the same time, platforms and ecosystems are a prerequisite for successful transformation of business models. PROSTEP sees itself as a guide accompanying customers on this journey. In a round table at the end of the program of presentations, the executive board and managers from of the various business units explained to the audience just how broadly the company is positioned, thus ensuring that it is well-equipped to tackle the challenges of the future. PLM strategy consulting, Industry 4.0 readiness, MBSE and validation, collaboration, blockchain and agility are the aces they hold when it comes to shaping the digital future. Not to mention major projects like updating Daimler’s Smaragd installation. "I take off my hat to you and want to thank you all for everything you are doing", Dr. Siegmar Haasis said in his presentation. That was certainly the best anniversary gift that PROSTEP employees’ could have received.